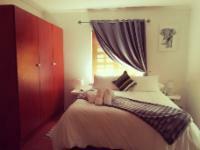 Mickey Finn offers four guests self-catering accommodation in Dullstroom. With rolling hills and a quaint town, Dullstroom is an endearing location. The house comprises two bedrooms with a queen-size bed and electric fireplaces for those cold, winter nights. The beds are made up with percale linen and are elegantly designed with earth tones. The main bedroom features an en-suite bathroom with a bath while the second bedroom makes use of a bathroom with a toilet and a shower. The fully-quipped kitchen has been elegantly designed with black appliances and wooden cupboards. Guests can enjoy, among others, a slow cooker and potjie for a true Highlands Meander experience. The lounge area has comfortable couches laid out around a coffee table and a fireplace. The couch converts to a sleeper couch and is able to accommodate two extra guests. A satellite TV and DVD player are also available in the lounge. Mickey Finn features a luscious garden area filled with birds and is ideal for a braai. Parking for two cars are provided on the premises. Guests of Mickey Finn can dine at Dullstroom restaurants like Duck and Trout, Art of Food and Mayfly Restaurant. Further attractions include Dimitrov Art Gallery and Anvil Ale House. Please note that you will receive a confirmation email from Dullstroom Reservations with the necessary information. Mickey Finn is 0.5km from the centre of Dullstroom , the nearest airport 110.6km (Kruger Mpumalanga International Airport).